we finally got our christmas tree up as well as the other decorations. hooray! david contributed almost all our ornaments during our marriage collaberation of goods. isn't that funny and unique? here are some of my favorites. 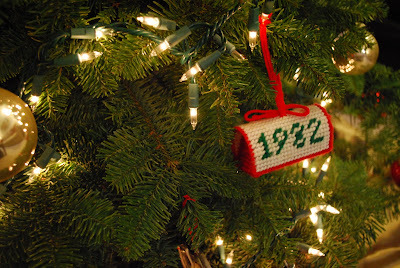 when david was a little boy he got the knitted mailbox ornament with his birth year on it. the front of the box opens little a real mailbox and, being the precious little boy he was, he plucked a few pine needles from the christmas tree and tucked them safely inside. he carries on that tradition every year and I think it's hilarious/adorable. 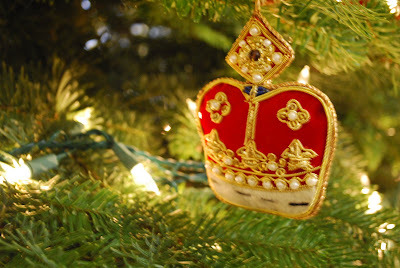 this one is from david's sister who brought back several ornaments for him from england where she lived for a few months in college. they're so pretty and traditional. 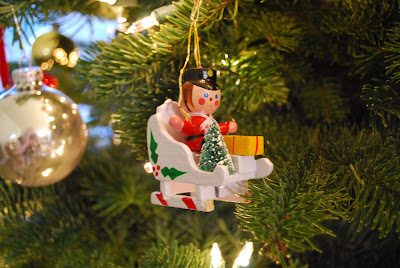 I'm not sure why I like this little soldier in his sleigh but it reminds me of a vintage christmas. 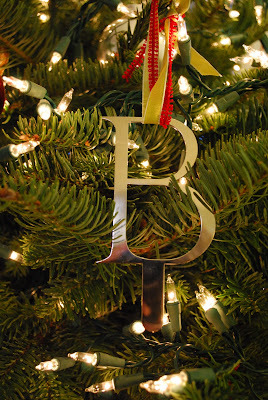 you may remember this cake topper from our wedding turned christmas ornament? my idea. 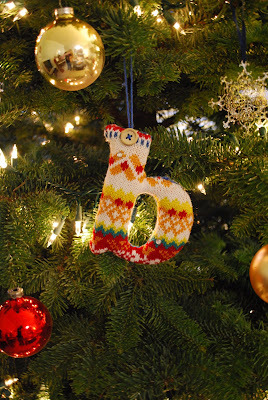 and I'm loving this little b from anthropologie. their christmas ornaments are darling. david also contributed our nativity (but the star was a wedding gift from stephanie's mom). david contributed both our nativities actually. this one sits on our coffee table for little hands to play with (hallie, I'm talking about you!) 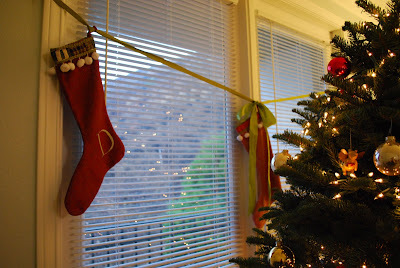 we don't have a fireplace mantle (sob) in our condo but you have to hang stockings somewhere, don't you? a little ribbon across our balcony windows did the trick. remember these stockings I made last year? I still need to make a matching one for william but it's on the to-do list . . . maybe next year when he's old enough to appreciate it. 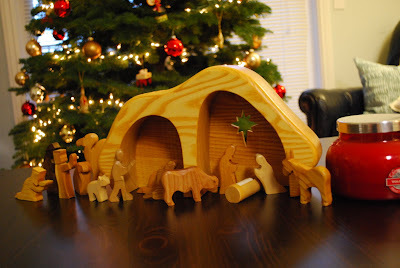 i love that little wooden nativity. everything looks great! your house looks awesome! 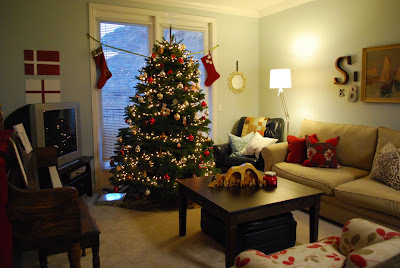 so cozy and christmasey. It made me really really really want to visit. ooh i can't believe we still haven't chatted in so long. shall we shoot for christmas break? Beautiful decorations! I just love Christmas!! Your place looks great! I can't wait to see the decorations in person! (and you better believe Hallie will be all over that nativity). We need to get together before we both leave to visit our families! I'll be back in town Wednesday night. my favorite is the awesome sled guy. soooo cute Liz! Very cute. I love seeing peoples Christmas decorations, it really gives me a good holiday spirit. I also love that your husband contributed most of your ornaments. My Hubs. is a bit of a scrooge, so I'm mostly on my own with Christmas stuff. Funny though, his dad contributed most of my ornaments. so cute! 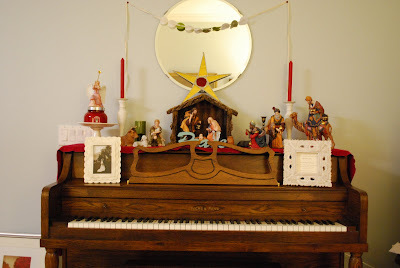 This reminds me that i need to get a nativity set! Love yours! Thank You for watching out for Miss Hallie and making sure there was something for her to play with amidst all of the lovely "do not touch" decorations.